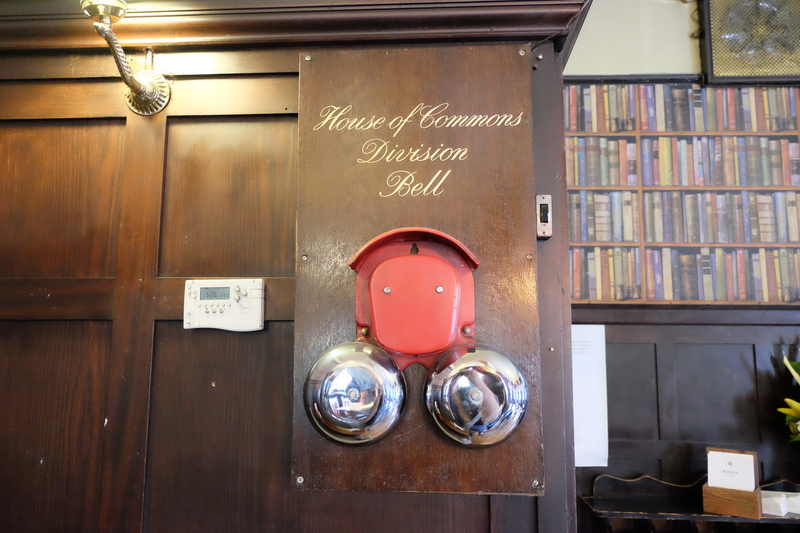 A call to arms – the pub division bells of Westminster – MostlyAboutBeer…….. I push through the glass door of the Blue Boar and ascend up a curving stair to be met with what looks like a concierge. He, like the others around and behind the bar, is dressed in a smart black waistcoat with a pressed white shirt gleaming through the lapels. Everyone sports a name badge. “Of course, sir – it’s a bar!” He gestures towards it. Outside the summer’s blazing. The fridges and beer founts glow in the comparative darkness making them all the more alluring. “And er… I understand you have a division bell on site for MPs when there’s a vote?” Further words trail off as he arrests me with an eager beam. He turns and I follow him under glass cases housing models of politicians past and present. We come to a polished metal boss on the wall – I’m looking at my first ever division bell. 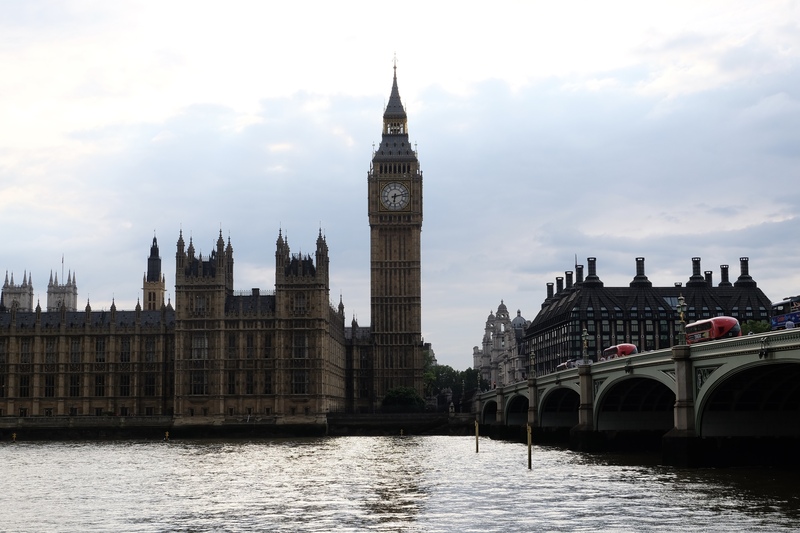 Around the palace of Westminster, division bells haunt six pubs and a multitude of restaurants, bars and clubs. 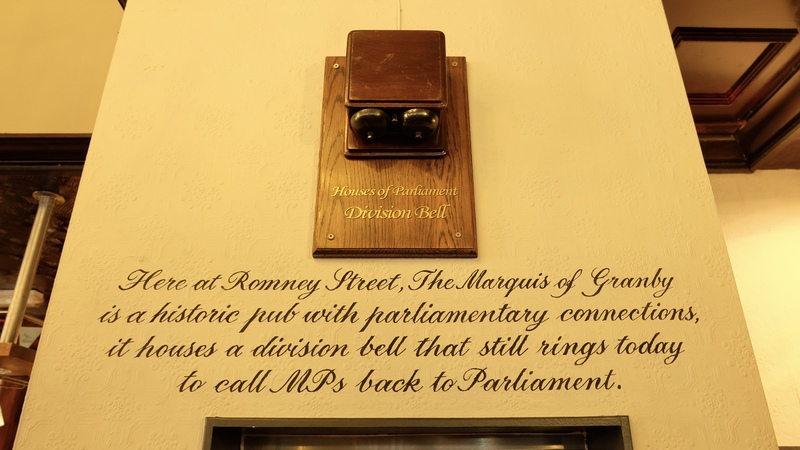 They’re called division bells because when they go off they recall MPs to a vote. The MPs divide by chamber to vote into the ayes and the nays. Though I’ve included the Blue Boar as a pub, I’d make a distinction and call it a bar despite its pubby title. It’s dark and cool – shelter from the baking heat outside. It’s tidy, shining and clean but not sterile. The staff are friendly and perambulate as official welcomers. 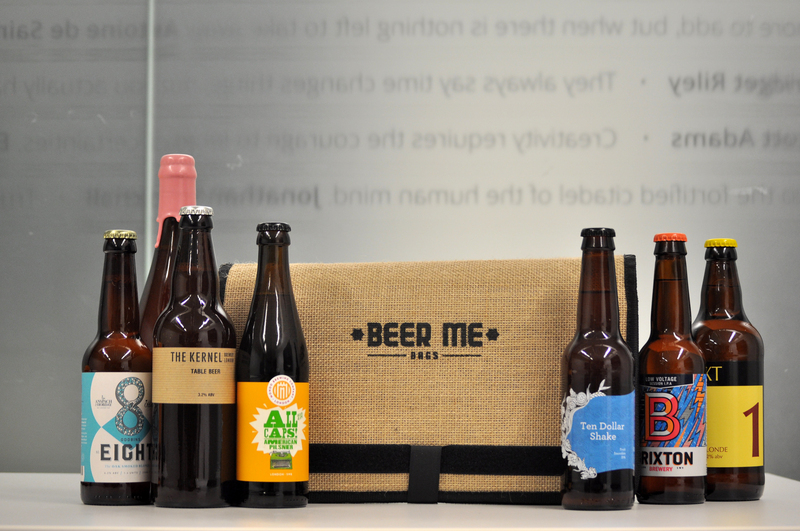 There is no cask beer but there is keg from Meantime so I climb up on a stool and hang my bag from a hook under the lip. I order a half of Yakima Red and it’s served in the brewery’s balloon glass with beads of condensation trailing their way down its bulge. It’s chilled, cherry-like, resinous and dry. It really hits the spot and is as photogenic as an advert. As you don’t pay up front, I do begin to worry how much this refresher might cost. When I settle, the bill’s served to me on a little tray and I’m relieved to find it’s only £2.70. For those of you channeling your inner Arkwright and screaming “Ow much? !”, anyone familiar with central London will understand that it could’ve been much worse. They let me keep the beer mat and I even leave a £0.30 tip. Visiting a cubicle in the gents, I find the end of the toilet roll has been folded into a point. After I’ve finished, I use my best origami skills to reinstate it. There are no hand driers – just laundered individual flannels. Absolute class. 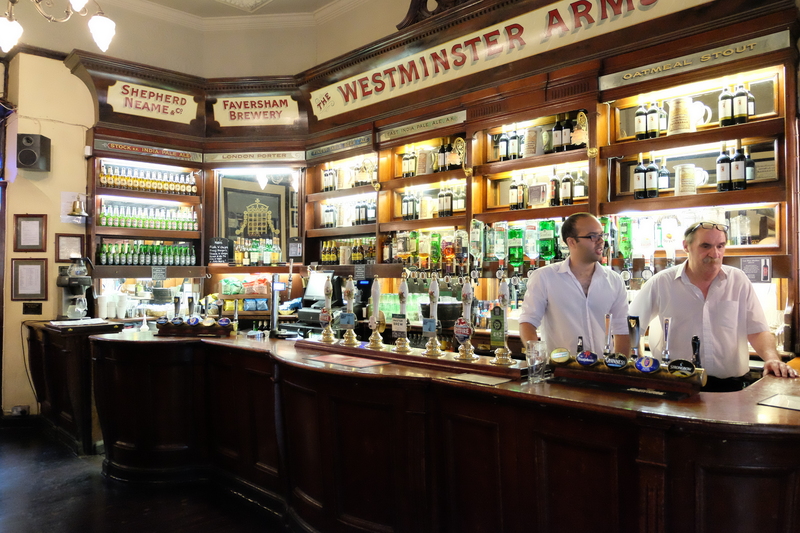 I leave the Blue Boar and proceed down Broadway to my second destination on Storey’s Gate: the Westminster Arms – a Shepherd Neame pub. I walk in and it’s wood panelled everywhere. Soft leather stools describe the room’s circumference under neat elbow shelves. There is no furniture in the middle of the floor which means that when it’s busy, it’s a hive of humans buzzing in symphony. There are also upstairs and a downstairs rooms which are more for tourists looking to eat. I don’t explore them. There’s a young man and an older man serving. Both seem to be French or Belgian so I suspect father and son. When you cross the threshold the elder asks “can I ‘elp you?” There are ceramic demijohns perched on high and I also notice some of the upper panelling at the wall/ceiling junction: old brewery advertisements proclaim Stock India Pale Ale (KK) and East India Pale Ale (AK). What I love the most is the pub’s original telephone number: simply Westminster 365. I’m looking for something else though. 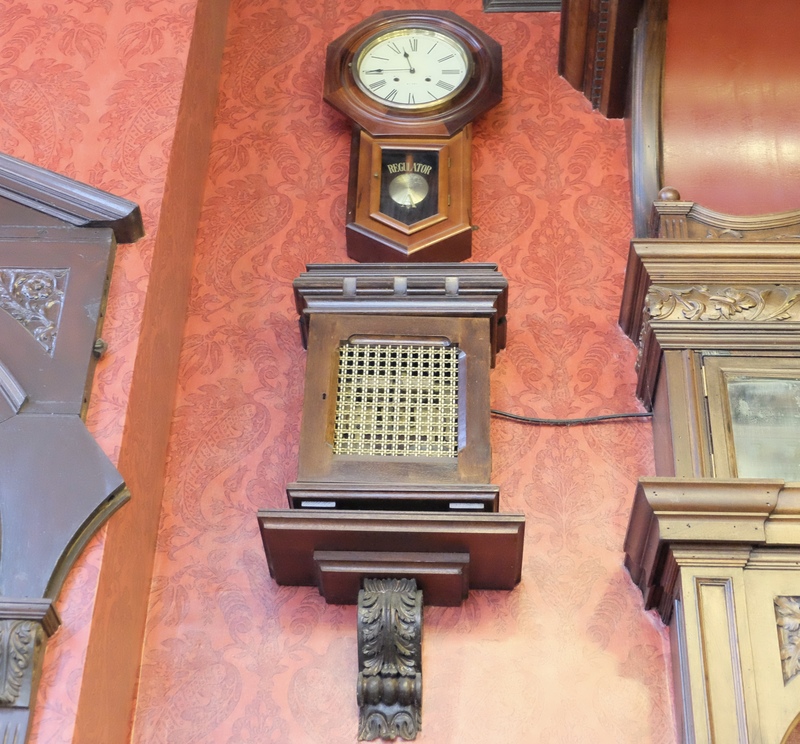 I approach the younger barman and get as far as the word division and he points it out on the wall behind me – it’s a beauty of walnut, bakelite and iron. Often when a two thirds majority is needed to pass a motion, the speaker (currently conservative MP John Bercow) will shout “empty the lobbies -divisiooon!” and the bells will then sound for exactly eight minutes. I order a pint of Master Brew and sit at the window. Like the decor, the beer glows like burnished oak. On the taste buds it’s treacly and malty. It’s desperately English and reminds me of a Werthers Original dissolving on the tongue with a background hint of leaf litter. 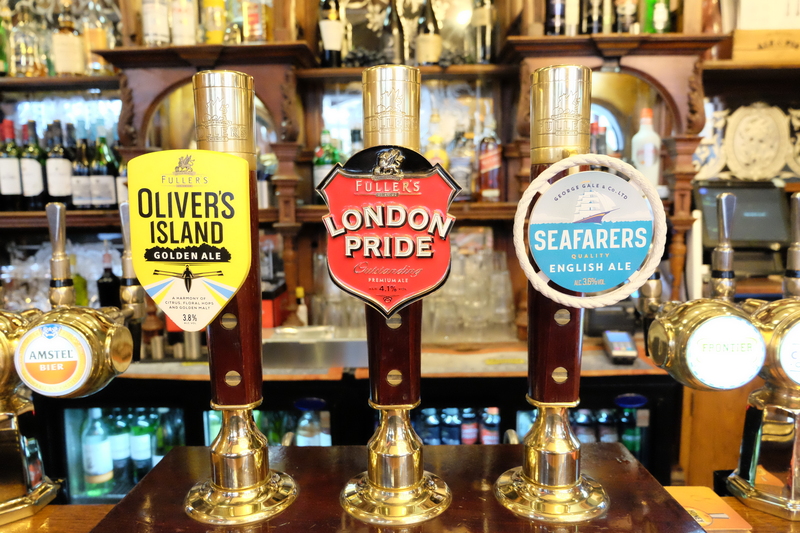 I never used to regard staple Shepherd Neame beers in this way – this has come about due to the comparative harsh, garish and aggressive souls of modern craft brewing. When you go back to them, older bitters taste more and more like Nesquik. 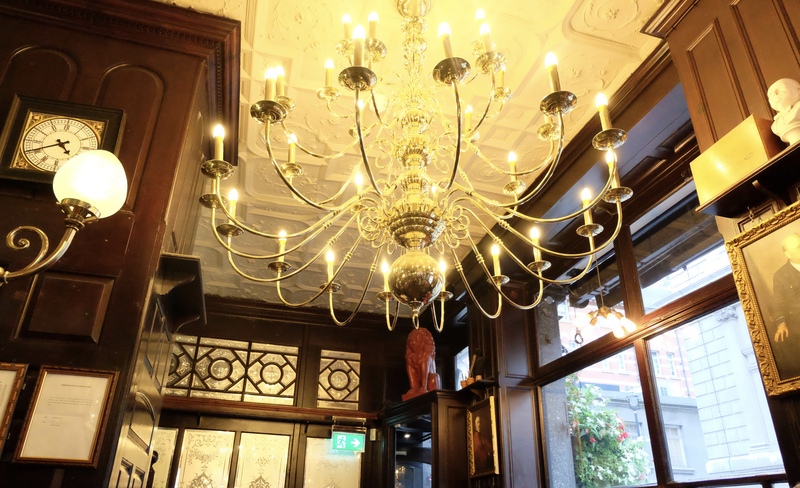 To get to the next pub you to go straight past Parliament Square and the east wing of the houses of parliament then traverse one of the busiest pedestrian crossings in Britain to visit St Stephens Tavern. It’s one of a handful of London pubs run by Hall & Woodhouse, aka Badger from Dorset. Both the interior and exterior of the pub are amazing. The outside is a sloping goods delivery access that looks directly at Queen Elizabeth tower (remember – big ben’s actually the bell inside). It’s at once a cacophony of sound – vehicles beeping, engine noise, tourists, people playing music – and complete serenity. I think it’s the surrealness of facing a postcard brought to life that takes the auditory sting out of it. The staff all have ear pieces – they’re “plugged in” – like the agents in the Matrix. Inside the ceiling seems to make a bid for the sky and the windows follow them all the way up. Each vertiginous pane is also etched and has its own taylor made curtain which in turn has its own taylor made cords with tassels. Mirrors behind the bar are backlit. There are double-topped circular perch tables (similar to a cake stand on top of a coffee table). There’s a TV screen on mute showing BBC parliament. Most beer engines dispense Fursty Ferret but there’s also Tanglefoot and First Call. I order a pint of the latter. It’s dark, sweet and tangy. Again, it’s been awhile since I had any of these beers and part of me wonders if they forgot to add the hops. 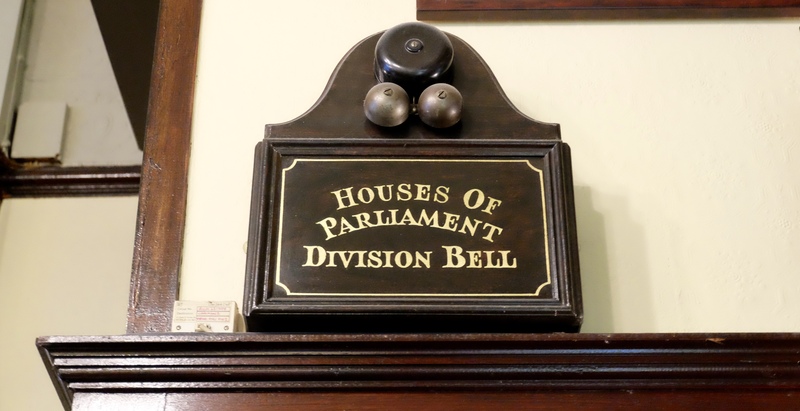 In the run up to the division, the preceding debates can last hours so many members of Parliament scurry off to nearby watering holes instead and remain there until their respective bells ring. I gaze up at the division bell which I saw as soon as I walked in. It’s high up the wall here fronted by a grille. It looks like the bottom half of a grandfather clock; an actual clock face right above it bolsters that comparison. I choose to cross back over the road and walk directly under the Queen Elizabeth tower in order to cross Westminster bridge and backtrack along the southern bank of the Thames. It’s worth it just to photograph the palace over the water. I cross back over Lambeth bridge into Millbank to get to Romney Street and the Marquis of Granby – a Nicholsons pub. The Marquis of Granby is a one room pub. It’s busy but most of the customers stand outside. There are luxurious burgundy leather couches and copper-topped tables. Two electric chandeliers give the interior a yellow feel. In a recess behind the bar, I’m surprised to see four casks on gravity tilted forward but none of them are yet ready to dispense. 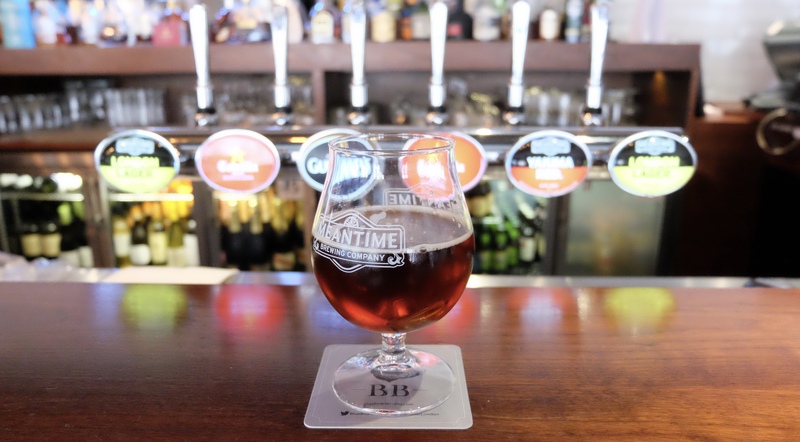 I opt instead for a pint of Trumans Runner – it’s dark amber and balances the malt with a sharp citrus zest. It’s the best thing I’ve had on cask today. The obvious question pops out and a woman behind the bar points me towards it. She surprises me when she says that it was going off every half hour on the day the commons voted on whether to keep Trident – Britain’s nuclear defence system. I presume there must have been other votes on the day. Members of Parliament have just eight minutes to get to the relevant chamber in the palace of Westminster and vote. Once the eight minutes are up, the chamber doors are barred. The Marquis’ division bell is the most interesting thus far. 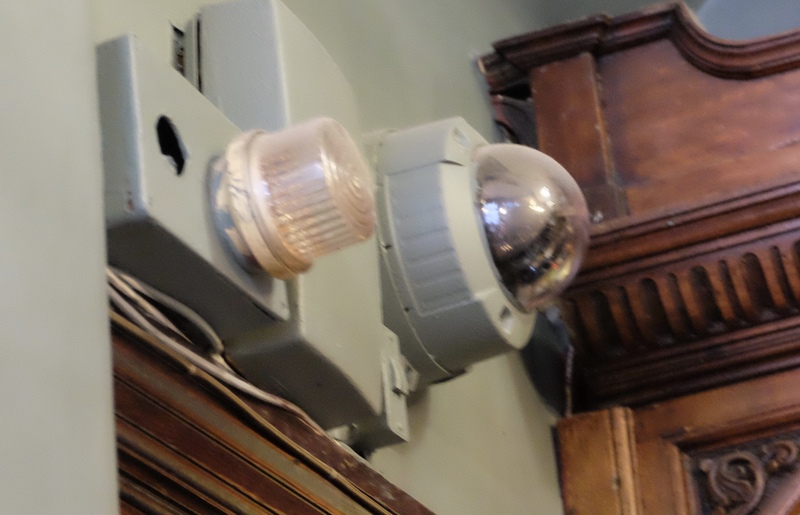 It looks a bit like a pair of binoculars mounted on a wooden noggin. Below it, a few sentences about its function have been hand painted in italic. Spotting my interest, a woman called Prue gives me her own little hand written card. 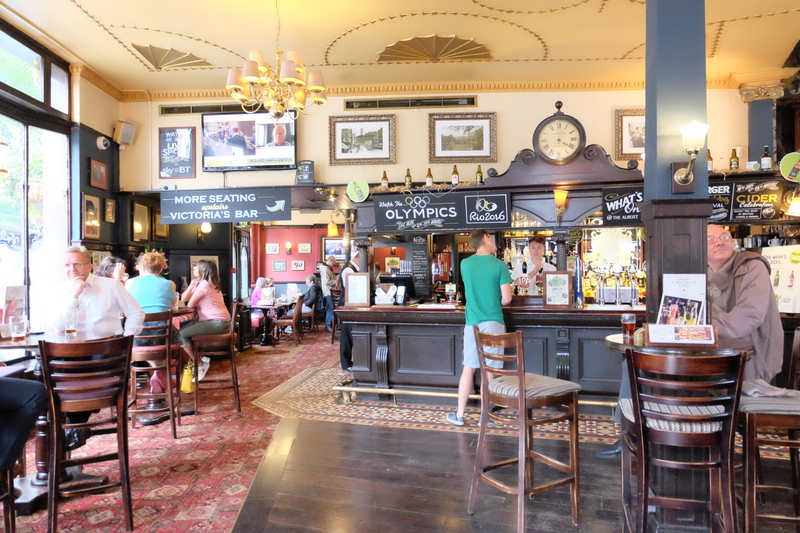 So far I’ve been impressed by the hospitality of staff in all the pubs – especially since they’re toiling in one of the most tourist-saturated slices of the capital. They’re true grafters. The next stop is on Parliament Street for a pub that stands virtually opposite Downing Street. The Red Lion is a Fullers pub. The inside needs to be visited to be believed: there are round window recesses perfectly encompassing their round tables. Hogsheads are also used to put drinks on. Behind the bar, and arguably forming it, is a one-piece wooden scaffold accommodating clocks, bottle shelving, ceiling columns and fridges. There are political portraits on the walls and two massive chandeliers. Even the hand pumps are taylor made – the most sturdy brewery-branded pulls you’ll see. On the downside, the Red Lion has the least majestic division bell so far to the point that the woman serving is quite apologetic about it. I order a pint of Oliver’s Island and take a few oblique shots with the camera. Because of the crowd, I can’t get a straight shot at it. 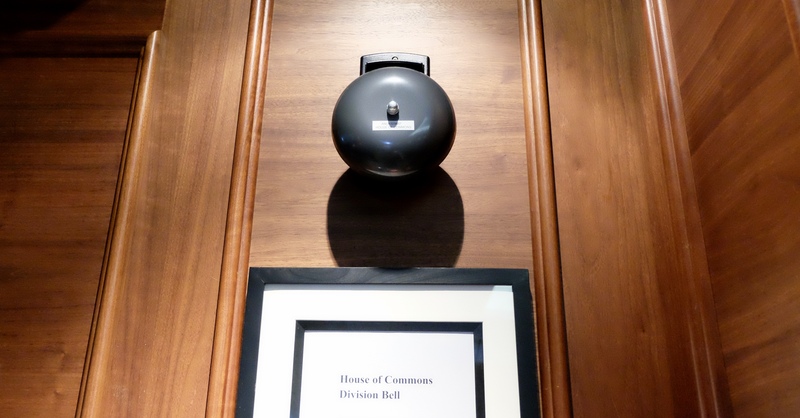 As you’ll see – my photo is as underwhelming as the bell. Members of the public and tourists often run outside at the ringing of the bells – they assume it’s the fire alarm. The last stop is a Taylor Walker pub called the Prince Albert on Victoria Street. The division bell is upstairs in a dining lounge with restrictive opening hours so it’s actually a return visit. When I go upstairs to immortalise it, it’s a beauty. The twin bells gleam in the peachy light. To get from here or indeed the Blue Boar to a voting chamber in the house of commons within eight minutes would require an MP to break Usain Bolt’s sprint record in my opinion. It’s not just the length of Victoria Street or Broadway, but having to negotiate the traffic lights around Parliament Square and then getting into the palace and its labyrinthine corridors itself. When you think about it, lots of MPs must stagger through the chamber to vote when they’re under the influence of alcohol. 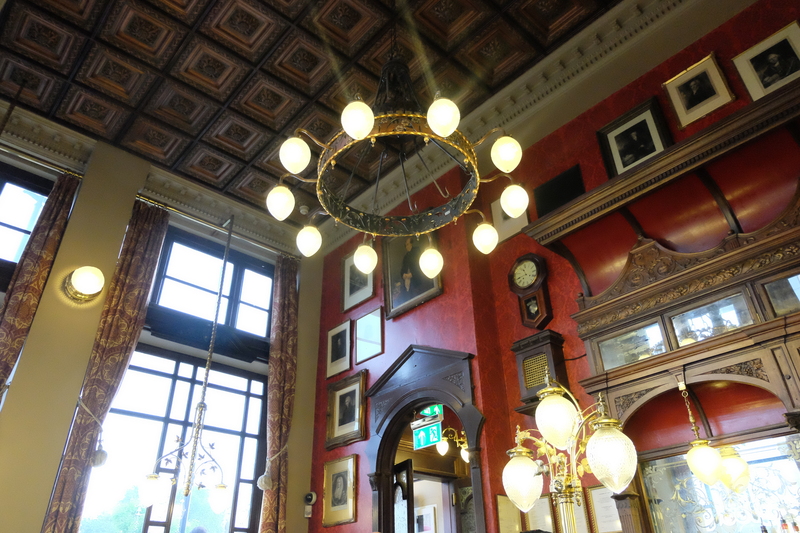 The Prince Albert interior is a mecca to Victorian pomp and confidence. The colours are walnut, burgundy, cream and black. Every pillar, table, elbow shelf and chair leg seems individually turned on a lathe. Light is multiplied through mirrors behind the bar. All the windows including the panes on the saloon doors are etched. I have a half of Trumans Swift – it’s golden, clean, dry and lemony. It seems our MPs would rather be out drinking than taking part in a debate. Perhaps they’re more like us than we give them credit for. I found that the pubs containing division bells are utterly proud of them and keen to point them out. Most installations look lovingly polished too.